"DENVER, CO – (December 20, 2011) – ARCHOS, an award-winning innovator in consumer electronics, announced today the upcoming availability of the first android 3.2 ‘’Honeycomb’’ tablet under $200, the ARCHOS 70b internet tablet. The new ARCHOS 70b IT is an enhanced version of the ARCHOS 70 IT Gen 8 that features an upgraded capacitive touch screen and a powerful processor at 1.2 GHz." With Android 3.2 (Honeycomb), 8GB storage, full access to the Android Market, 1024x600 capacitive LCD, and a fair complement of ports, this may be a good buy for those that don't like (or want) the Kindle Fire's training wheels (UI). With "only" 512MB RAM, I don't expect lightning performance, and the lack of details as to the nature of their "powerful processor" is a bit puzzling. 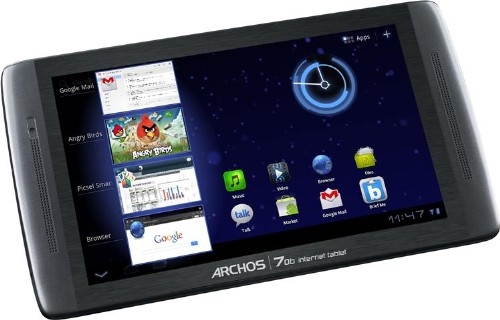 I've seen ARCHOS products in retail stores, but haven't had the desire to test one, but the 70b may change my mind. I had a Kindle Fire, but wasn't impressed, and sold it, maybe this will be a better (or real) introduction to Android. Anyone have experience with ARCHOS products?